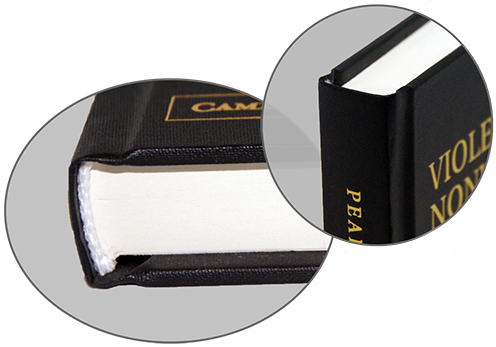 Our case bound books can be produced with accessories. The book in the picture can have a jacket applied. This is common for books looking for an eye-catching marketing tool. Alternatively, your book could have a printed case cover. 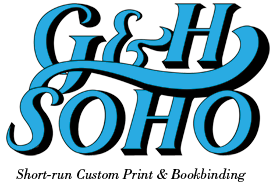 Regardless the style, this book can be printed on whatever paper you like and in any size that you want. On the left is a picture of a hardcover book with a jacket. As you can see, the jacket wraps around the entirety of the book and also includes a colored image. The picture on the right is an example of a printed case; meaning the cover is adhered directly onto the boards of the book. All of our hardcover books utilize binders boards and meet rigorous library specs. They will stand to the test of time and last with repeated use.